The crested breeds are the most interesting and beautiful of all chickens with their full, feathery crests. The baby chicks are especially pretty and cute as the crests show up as little top hats right from the start. These breeds are very quiet and gentle and don't seem to stray too far from their yard. They are excellent layers of white eggs too and although not very large are fine eating birds when prepared for the table. 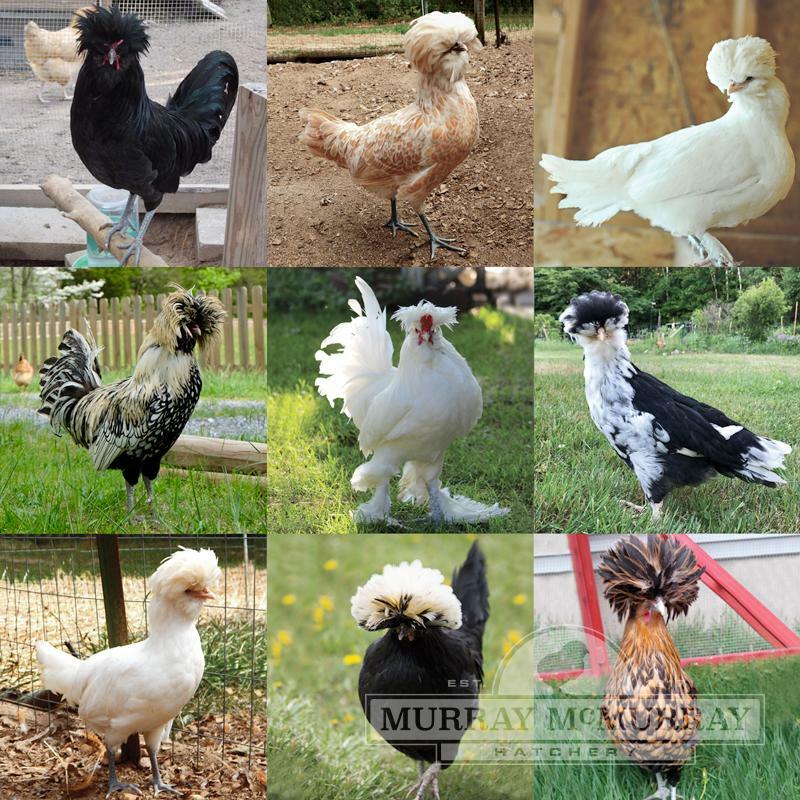 This Top Hat Special is an assortment including at least 4 different crested varieties from this list: White Crested Black Polish, Buff Laced Polish, Golden Polish, Silver Polish, White Polish, Mottled Houdans, and Sultans. They will be the wonder and amazement of your friends and neighbors, a real joy to own. The deadline for ordering for the next week is 11 a.m. Friday, Central Time. Because of conditions beyond our control during incubation, we are unable to guarantee hatchability. However, all the eggs we ship will be fresh and guaranteed to get to you in good condition. All egg shipments are insured. Report any broken eggs to your delivery driver. Call us for replacements. We ship eggs to all 50 states.. All egg orders are Shipped Prepaid. DisappointedI purchased 40 hatching eggs for my school. The package arrived with 48 eggs, 2 were broken. Package was in decent shape on outside, but loosely pack on inside. We placed 46 eggs in incubator. After the first two weeks we charted that 34 of the eggs were not fertile. We communicated with company and they said to call back after the hatch. 9 of 46 hatched. The 9 chicks failed to thrive. The company replaced the eggs in hope that the problem would not reoccur. The second set of eggs arrived loosely packed inside the box with a few broken eggs. The second set arrived after letting eggs acclimate we placed 46 eggs in incubator. This time we decided to lock down the incubators for the full 21 days. We did not open to candle. We always keep our incubators at 99.5 degrees and humidity 50%-60%. Last week we hatched 6 of 46 eggs. The 6 chicks are doing great!! I called the company about the 13% hatch rate. I was asked by the customer service person to break the eggs and examine the 40 unhatched eggs. 2nd RESULTS__35 non-fertile and 5 fertile eggs that did not thrive. While the eggs were being checked I received a return call from the company stating that they could not do anything about the non-fertile egg, because they do not guarantee the hatch-ability of the hatching eggs they sell. I appreciate the company sending the replacement eggs, but unfortunately 69 non-fertile eggs in 2 batches is very disappointing. We are now stuck with having to find a variety of baby chicks to purchase locally to complete our grant project. I do understand this is the companies printed policy, but sometimes in life doing the right thing supersedes the policy.